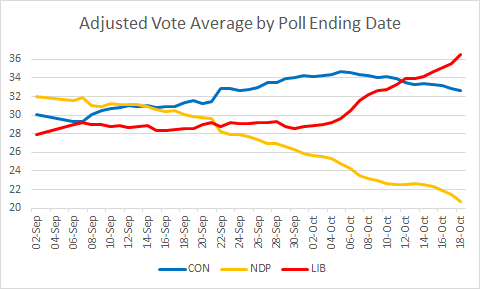 The daily Nanos is out, and it's the best poll of the campaign for the Liberals: a 4-point national lead and a 10-point lead in ON. Has the Tory rise crested? It's too early to tell. 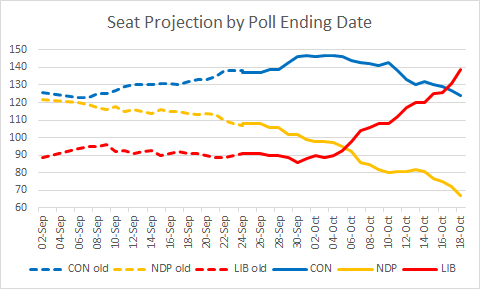 However, the NDP appears to still be sliding. Mainstreet also published 6 riding polls in ON. Nothing surprising, except that Brampton East is a Liberal/Conservative instead of a Liberal/NDP race. I have no idea if there's any local issue there, but this poll is so far from the projection that it calls for a riding adjustment. Consistent with the adjustments so far, I will change the model in the direction of the poll, but not all the way there. Conservatives +5, NDP -5 in Brampton East. 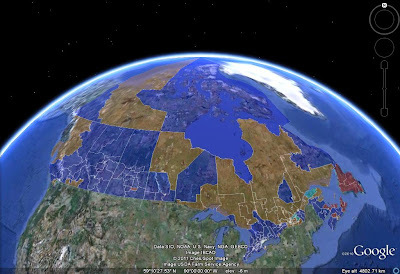 In any case, for now, the riding is Liberal whether one makes a full, partial or no adjustment. I really enjoy your site. Just wondering if you intend to analyse the poll EKOS released yesterday?